In Summer 2014, Ryan Vroegindewey used the Student Media Grant to travel to Mali, where he chronicled the relationship between rural food security and market participation through stunning photography. The Student Media Grant awards up to $5,000 to current students interested in capturing issues facing fragile and conflict-affected areas of the world through photos. Other winners have traveled to and produced photography highlighting issues in Nigeria, India, Nicaragua, Kenya, Haiti, Guatemala, Ethiopia, Perú, and other conflict-affected regions. This summer, I will be conducting research throughout Mali to examine the relationship between rural households’ food security situation and their participation in markets. In Mali, a farming household will usually market its agricultural products either by simply selling on open markets or to traders. However, in other cases (which are somewhat rare for the case of Mali), farmers and farmer organizations will enter into longer term contractual relationships with agribusiness such as cereal mills in order to better link themselves to modern markets. My primary research question seeks to explore how these different modes of market participation work, and what their impacts are on household food security and other outcomes at the household and community level. As food security is a complicated and multi-orbed concept, my blog posts will likely touch on related topics that contribute to and describe food security in Mali, including climate variability, supply chain and market systems, household food access, and nutrition. To study these issues, my field research will focus on three or four rural communities in which farmers are participating in supply chains through some form of contract farming. About half of my time at each site will be spent with a random selection of such contract farmers, and the other half will be spent with households which do not participate in contract farming. I will also be collecting data from key community members and organizations and other supply chain actors in order to get a broader, system-wide understanding of the market’s role in food security. My primary data collection tools will be photography and semi-structured interviews, and I hope to devote at least a couple blog posts to my ongoing reflections on how photography can potentially be used as a tool in the data collection, analysis, and reporting stages of agricultural economic research. As my field research evolves, I also plan to post photographs from the field in addition to preliminary observations and findings. In addition to thanking the Howard G. Buffet Foundation and Texas A&M for their support and the opportunity to conduct this summer’s research, I would also like to gratefully acknowledge the additional support provided by the Syngenta Foundation; the Agricultural, Food, and Resource Economics Department at Michigan State University, and the African Studies Center at Michigan State University. I have been in Mali for about three weeks now, and just completed the field work for my first case study, which focuses on the agricultural livelihoods and commercial activities of millet and sorghum farmers in the central region of Segou. The small sample of farming families that I spent time with are members of a large producers’ union—Mali’s largest, actually—that provides an important packages of services to its farmer members. First, each year prior to the agricultural campaign, the union helps farmers to plan their coming year’s food needs and to project agricultural surplus. Based on this planning exercise, the union then signs a one-year contract with the farmer which provides him or her with credit for agricultural inputs. At harvest the union pays an agreed-upon purchase price to the farmer for its surplus millet and sorghum, minus input costs. Technical assistance and marketing services are also provided to farmers, and at the end of the commercial season any profits are returned to farmer members as a dividend payment. Millet and sorghum are important food security crops in Mali both because of the great latitude with which they are consumed, but also because they are among the basic crops that farmers market to meet household needs for which only cash can provide. A millet-farming family at their home in Segou. While I was not able to catch planting activities (which get started in the next few weeks), during the interviews farmers exhibited some of their tools and equipment. Millet grain. Access to high-quality millet seed is one important factor contributing to productivity, but usually requires access to credit. A simple semoir, which trowels a hole and sows seeds. Basic as it may appear, such assets are important to farmer productivity and lack of such equipment was most often cited as households’ number one agricultural constraint, in addition to inputs. Traction animals such as bulls and donkeys pull field equipment and transport product. Such equipment is usually produced by a local iron smith. Following harvest, there is a very time-consuming post-harvest process that traditionally is almost exclusively done by the female members of a household. Post harvesting activities include threshing, drying, dehulling and winnowing the grains. The union studied in this case study also offered a credit program to farmer cooperatives for the purchase of diesel-powered threshing machines. A hefty investment, but one which can make important improvements to the quality of commercialized grains. Dehulling with mortars and pestles. Before a household considers marketing millet or sorghum, its first priority is to produce enough grains to meet the caloric needs of its members. Lowland (local) rice is a secondary cereal that is consumed. While the bulk of farmland goes to cereals production, ingredients for sauces and the occasional proteins are acquired in a variety of ways, including small plots of secondary land, market purchases, household animal-raising, game-hunting, or gathering. The bulk of harvested grains are stored in household greniers, continually accessed throughout the year for meals. The smaller grenier pictured above is for the women of the household, and illustrates the reality that in a given year, women will often only have access to limited and marginal lands to farm cereals or other crops. A farmer and his son breakfast on tot and sauce. Many of the surveyed households said they consumed tot twice in a given day — late morning and early afternoon — to fuel the day’s physical activities. All households raised chickens in some shape or form, although they are seen more as a source of cash, or for special occasions, rather than a regular food source. Most households reported consuming fish or hunted game as their protein source several times during the week. Markets are an inevitable and important aspect of farming and household food security. Most households interviewed manage to market at least 100 kg of millet or sorghum per year, per one of the requirements of their membership in the producers’ union, but still rely on the market for a variety of needs. Despite the name painted over the door, this farmer’s cooperative uses this building to collect its members’ surplus grains, which are then picked up by the union and marketed to traders or other buyers. The quality and accessibility of rural roads– which connect farmers to outside markets– vary greatly by village and time of the year. This road (at the end of the dry season) would be considered in very good condition. Without the marketing assistance of the producer’s union– which is extremely unique in Mali in that it sets its own price– most farmers rely on local traders and their given price, when marketing any product. A carpenter-farmer making a bed frame. In addition to the marketing of surplus grains, interviewed households will pursue other income-generating activities to complete their cash needs. This farmer’s wife purchases and resells mangoes on market days to earn extra cash. Households usually gather their own firewood from the bush, but may also resort to selling gathered wood for additional income. This farmer rents this truck from the owner, and transports grains between villages and market. Virtually every farmer interviewed cited a recent drought or flooding event that represented a significant production shock. This farmer explains how last year he lost much of two hectares of sorghum to drought-like conditions. Behind him are the dried-out sorghum stalks which he can only use for animal feed. Fortunately, most households interviewed had access to potable water through a village pump. Local wells are the other source of water. In a given day women are occupied with a gamut of domestic, commercial, or social activities, and thus were very difficult to catch for interviews. Mali is a vast and diverse country, and just a day’s worth of travel from the Segou to Sikasso region can bring out this kaleidoscopic reality. Although the regions are adjacent to one another, there are many important agricultural differences. Perhaps especially this time of the year: while Segou had not yet emerged from the dry season when I was there, less than a week later I found that farmers in Sikasso were already heeding the counsel of the first rains in tilling their fields. Instead of Segou’s varying shades of brown, deep greens rooted in rich red earth dominate the landscape of its southern neighbor. Most farmers in Segou focus on millet and sorghum, and would perhaps market only a handful of cash crops if they are able – usually sesame or peanuts. In stark contrast, Sikasso – the “Cote d’Ivoire” of Mali as was cited several times—offers an overwhelming variety of cereals, fruits, and other cash crops. One likely benefit of this agricultural wealth is that households have more farm-based opportunities to participate in markets as sellers. Households cited a number of crops that they market, ranging from cereals and cotton, to bananas, shea, and garden vegetables. There’s also a wider range of cereals produced here, to include lowland rice, millet, sorghum, in addition to maize. For its part, maize appears to benefit from more diversified market demand than does millet and sorghum further north in Segou. Through my field work in Segou I could only identify one private sector buyers (aside from a two or three traders) that purchased directly from producer organizations. In contrast, several maize producer organizations are selling directly to a mill, one large producers union had commercial agents in Europe looking for buyers, and I heard of several small processors building their own maize supply chains. Despite these comparative advantages, maize producers still have important constraints that limit their productivity and market participation. Farming households seem to still largely have a sustenance farming orientation in which they produce maize first and foremost to feed their families, and usually only market maize to either repay inputs loans, or as an afterthought to ensuring that the family cereal stocks will last the entire year. Access to inputs and equipment, an issue inextricably tied to access to credit, is also a yearly challenge, even for those in producer groups. Climactic problems do not also escape this region, as most farmers cited erratic rains as a recent agricultural shock. Additionally, despite the diversity of foods found in Sikasso, this region consistently posts some of Mali’s highest chronic malnutrition rates an issue commonly refered to as the “Sikasso Paradox.” Perhaps related, households reported serious sickness or death of family members more than households in Segou. Below are some illustrative images focused on the production, consumption, and market activities of maize farming households that I interviewed while in Sikasso, and also some from the southern Koulikoro region which is also an important maize production zone. As with millet and sorghum, my maize research focuses on households which are involved in some type of “contract” farming model, usually taking the form of a yearly engagement (with either a trader, processor, or the producers group itself) to receive agricultural inputs on credit at the beginning of the agricultural season, and to repay these in kind at harvest. According to the assets, food sources, and income sources reported during the interviews, households are either “middle” or “better off” in terms of the FEWSNET wealth rankings for this zone. This would imply that these households are spread out among the roughly the upper 50% of the population in terms of wealth. This household participates in one of the maize “contracting” partnerships that I studied while in Sikasso. All three of the households that I interviewed from this partnership had homes made of cement walls and metal doors, a somewhat rarity in isolated villages such as theirs. This family was in its second year of participating in myAgro’s unique access-to-inputs model, which invites farmers to save-up for fertilizer and seeds rather than taking out credit. Here, they’ve placed their fertilizer and certified seed in gourds to facilitate application on planting day. Farming is on all-family affair, with labor divided among members and the male household head directing the work. These siblings are preparing the soil for planting. All households that I interviewed had at least one pair of traction animals and several animal-driven farm equipment. This image gives an idea of the magnitude of work involved in manual farming. This family team of four were in the slow process of applying fertilizer and fertilizer on about half a hectare (about 5000 meters sq., represented by the field in the foreground), and over the course of two hours had only advanced several meters beyond the path where they started (the lighter-colored strip of brown). This father instructs his son on the application of seeds. Women from the nearby village periodically passed by, bringing lunch (maize-based tot and sauce) to the male members of their families working in the fields. A grinning farmer bikes home an “improved” seeder, financed through his myAgro account. Similar to farming households in Segou, families in Sikasso will process (dry, thresh, and dehusk) harvested maize before storing it in cereals granaries located within the housing compound. The majority of Malian farmers save the best grains of a given harvest as seed for next year’s crops. While “traditional” seeds may have some food security advantages when access to good commercial seeds are limited, newer adapted varieties can offer much higher yields, pest-resistance, and even a degree of resilience to erratic rainfall. Contract farmers usually benefit from such certified seeds. The women of this household consolidate their remaining maize stocks into a family silo. The majority of households interviewed reported that their cereal stocks last the entire year, suggesting again that these households are not among the poorest groups in their zone. A woman sits in the kitchen and makes maize tot, while also managing a couple children playing at her side. While Sikasso offers vegetable gardens, mangoes, and an array of other fruits, and even livestock, I frequently saw children with pot-bellies or red-tinged hair, signs of chronic malnutrition. This future-hunter caught, killed, skinned and roasted a mouse over the course of one interview. “Bush meat” is often consumed (and savored!) as a protein source. A girl pulls water from a village well while her little brother stands back and cautiously watches me. All villages also had pumps. Maize that is not stored is either paid as in-kind reimbursement for inputs advanced at the beginning of the season, or else marketed in small quantities. If farmers are not part of a marketing cooperative or other scheme, they are price-takers selling to collectors who act as intermediaries between village-level markets and regions traders. The market road leading to one particularly isolated village. This Sikasso poultry feed producer is in the process of building his own supply chain of maize producers. Quality, quantity, and stability of supply were priorities for the functioning of his business; therefore, he was willing to pay a nice mark-up above the market price to his suppliers. Outside the warehouse of one large regional trader. The scale seen on the left is typical. While most producer organizations and all traders have one, weight disputes are quite common along the supply chain. A cereals retailer in Sikasso town. A cereals retailer weighs yellow maize. One of the two women’s maize producers groups that I interviewed while in Sikasso. I found that female-led maize production to be different in several important ways from family maize production (in which everyone contributes to, but is male-led). First, the latter type of farming is intended to cover household cereal needs, while the former is more oriented towards revenue generation. However, women faced additional production constraints (land, inputs, equipment) compared to male-led farming. The Office du Niger (ON) zone is quite unlike any other area of Mali. Created in 1932, the ON is a public enterprise consisting of a vast network of damns and irrigation canals which direct water from the Niger river to thousands of rice fields. For families living in the ON, it almost seems as if most aspects of life are framed and formed by the production of rice. The most obvious manifestation of this is the dominant manner in which rice production, processing, and marketing occupies household calendars and economies. Even entire villages have been established as rice production “colonies,” and their geography often hugs the banks of the primary canals that irrigate fields. Farmers in the ON can potentially benefit from a number of production and commercial factors which other Malian farmers often do not have access to, including irrigated farmland, a local government institution dedicated to supporting rice production, subsidized fertilizer, and and a relatively high density of production and marketing organizations. However, irrigated rice also has its unique challenges, which include very limited access to land (and related land conflicts), and the danger of falling into debt given relatively high production costs combined with an opportunistic local paddy and rice grain market which appears to take advantage of farmer water and credit payment cycles. Several different models exist in the ON that attempt to help producers overcome these production and marketing challenges, which I studied while in the ON in addition to spending time with rice producers. A rice farming family poses for a portrait in their concession courtyard. The members sit behind a tarp of recently-harvested rice paddy. The families that I interviewed, such as this one, do not usually practice more than one acre of off season rice production, which they observe can impoverish the soil and reduce yields in the following primary rice season. Those who do practice some off season rice production appear to do so to help manage debts, and to complete household stocks before the hungry season approaches around August or September. While most of the households I interviewed appeared to fit into FEWS NET’s middle wealth category, I think that I encountered a bit more of a spread of household wealth compared to other zones, with a couple households appearing to fit into the “poor” category (with only four ha or less of cultivable land, and very limited farm equipment and livestock holdings), and a few in the “better off” category with 10 ha or more of land and motorized farm equipment. One possible reason for this broader encounter of “contract” farming households in the ON (as opposed to other production zones in Mali) is the higher use of inputs (fertilizer and improved seeds varieties), greater financial demands (for water user fees and input loans), and potentially more complicated marketing dynamics, all of which may push farmers to be more involved in a production and marketing system. Some farmers indicate the secondary canal door which lets water pass into tertiary canals to irrigate fields. Canals are supposed to be annually maintained by the ON authorities and farmers; however, both sides report that canals are often not properly cleaned, which can result in irrigation problems and increased farming inefficiencies at the plot level. A motorized cultivator prepares a parcel for rice seedling planting. Irrigated rice farming is a muddy and labor-intensive activity, and can be expensive if farmers don’t have access to motorized equipment such as this one, which can perform multiple tasks. This dogon boy has traveled with other members of his village from an eastern region of Mali to find work as day-laborers on ON farms. At this time of the year, such seasonal labor-migration is common in the ON, and largely consists of Malians from millet and transhumance livestock rearing zones of Mali. A group of laborers such as these are paid between $40-50 per hectare for the transplanting of rice seedlings, an activity which may take a group such as this about two days to complete. Farmers may also employ local farm labor groups, especially women for planting and post-harvest activities. Rice farmers break for lunch under the shade of a tree next to one of their parcels. A farmer poses between two of his rice parcels. On the left side of the photo are rice seedlings. After about two weeks, seedlings are transplanted in lines, as seen in the right of the photo. Although labor-intensive, most interviewed farmers use this intensive approach, which still unfortunately only reportedly gets mediocre yields of about 4.5T/ha, much less than optimal yields for this zone which can reach 6 tons or more per ha. Other improved approaches are being piloted in the ON, but these are even more labor-intensive, and thus can be difficult for many farmers to put into practice given equipment and labor shortages. This rice entrepreneur proudly displays an enlarged photograph taken of her years ago during a visit by First Lady Laura Bush. There have been several important U.S. aid projects in the ON, the most notable of which was the recent Millenium Challenge Corporation’s $230 million investments in rice production and marketing infrastructures and services. After being threshed, rice paddy is processed for a fee by a rice hulling machine, which can vary in size and performance from small mobile machines to large ones such as this rice mill which can process about 10T a day. The rice byproduct can be sold to livestock raisers as an ingredient in livestock feed formulas. Another ON rice producer and processor. Years ago, this entrepreneur negotiated a lease with the ON authorities for over 500 ha of irrigated land, which led to the immigration of many families from his home village in northern Segou to a new village which bears the name of its founder. Today he provides seed and fertilizer to the nearby farmers, who in turn sell a portion of their paddy for his rice milling factory. Most of a typical household’s net paddy harvest is stocked, then processed, sold, or consumed as required throughout the year. This woman winnows rice which has been hulled by hand, possibly with the mortar that lays sideways in the background. A tractor also sits in the background. Such motorized equipment is a much more common sight in the ON than in other grains production regions of Mali, even though limited and inadequate equipment is still a top constraint cited by ON farmers. This tractor is owned and operated by a village farmers association. The main warehouse of a farmer-owned rice processing coop, one of the commercialization models which I studied while in the ON. The coop is based in the town of Diabaly, which was momentarily occupied by jihadist groups at the beginning of 2013. Bullet-holes in the warehouse ceiling and fissures in the walls remain as a reminder of this difficult time. Although the occupation lasted just a few days, general insecurity in the area forced this processor and others in the area to halt activities for a whole commercial season. Following French and UN military intervention beginning in 2013 and lasting through today, the ON zone is largely secure at this time, and commercial activities have started back up. Rice trade is unique from the commerce of other Malian grains in that for years it has had a rudimentary classification system. This rice — normally consisting of about half broken pieces and half whole/long rice grains — is often called RM-40. Many consumers prize 100% extra long grains, which creates opportunities for value addition through sorting and packaging. An example of branded rice. Many mini rice mills such as this one use specially made bags to market their material to Malian functionaries and to urban consumers. Paddy drying on tarps at a well-known Niono mini rice mill. Often middle-class consumers (SUV in the background) will come all the way to such mills to purchase 50kg bags of sorted rice. The machine to the left threshes the paddy before it is hulled. Some village boys pretend to rice farm along a dirt road. 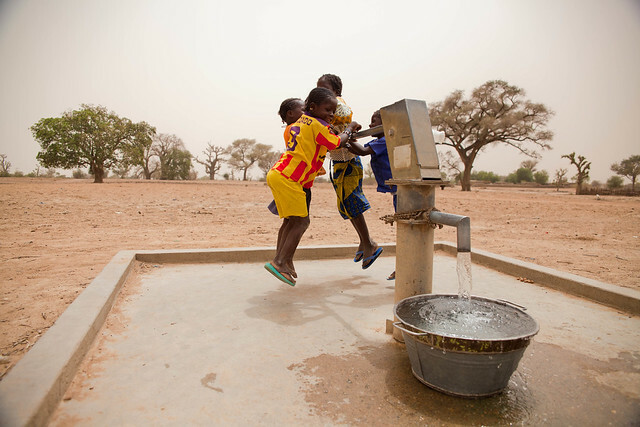 Although land in the ON technically belongs to the Malian state, according to one authority so long as a small farmer continues to farm and faithfully pays his water user fees, he can usually stay indefinitely and transfer his farming permit to the next generation. An elderly woman in one household spins cotton into yarn. The ON was originally conceived as a bastion for both rice and cotton; however the latter crop was eventually abandoned after Malian independence. Like maize, millet, and sorghum, rice production is driven the males of the household. Sometimes women may cultivate small gardens which often focus on shallots (shown here), tomatoes, and other products. Despite the relatively high population densities in the canal zones, grazing cattle is a common sight. Many households cited limited land as a constraint that they face, and a couple recounted cases of land conflict. Artisanal fish farming is a common practice for families. Most consume fish as their primary protein source, and a few try to earn additional income as they are able to sell small quantities of fish. A woman walks along one of the primary canals that span the town of Niono, Mali’s “rice capital” which is the production and commercial hub of rice activity in the ON. My indispensable Mali research team — Fatou Sanogo from IPR-IFRA, and our wonderful driver, Ousouby Kant. This summer I was very lucky to be assisted in my Mali research by a Malian agricultural economics student named Fatou Sanogo. Fatou’s research internship was part of her capstone graduation project at Mali’s national agricultural school, l’Institut Polytechnique Rural de Formation et de Recherche Apliquee (IPR-IFRA). IPR-IFRA and Michigan State University’s Agriculture, Food, and Resource Economics program (MSU-AFRE) have a strong, ongoing partnership of agricultural research and institutional development, and this summer’s research project was an opportunity to participate in a small way in this capacity development program. All summer Fatou provided priceless Bambara translations, helped out with logistics and planning, and contributed to the synthesis and analysis of data. Additionally, in early May Fatou was given a DSLR camera and a bit of photographic training, and was asked to also take photographs while in the field. Throughout my time in Mali, Fatou and I frequently shared and discussed photos, and had the opportunity to reflect on the roles that photography might play as a a type of data, an aid in agricultural and economic analysis, and as a tool in communications and reporting. It was usually interesting to note the different photographic opportunities that Fatou and I would find as valuable and informative — for example, I would sometimes shoot scenes that were quite normal for Fatou, while she would often take special interest in capturing objects or activities that were novel or meaningful to her as a female Malian who has grown up in urban Bamako. Below are twelve photos that Fatou has selected on the general theme of food security, reflecting particularly in terms of the four dimensions of food security — availability, access, utilization, and stability. I’ve also included below any titles for her photographs, and her captions translated into English. “Aide Emploi” — Young people are walking from village to village in search of food. Work in a rice field in the Office du Niger provides them easy access to food and even compensation. “Nourriture Saine” — In some areas of the bush food access, but healthy utilization for human consumption can be hard. “Aisé ou Pauvre” — In the bush, as this picture shows, moderately poor families are those who own more than one pair of sheep. Families stock cereals which provide for home consumption needs, usually until the lean season which is 1-2 months before the next harvest. “Au Revoir au Jeu” — Young producers have their way of saying welcome to the crop by songs and dances. This image reveals the confidence of young people regarding the challenge that they are about to face (hours in the field plowing, sowing, and harvest). “Commerce Femme” — Shea nuts are easy to use for the benefit of women in this area because of their by-products, such as shea butter soap. Women help their husbands in the household, but at times we also found that women have access to cultivable land too. Young people and women still support the household head in his work. Road conditions help to ensure stability of food or a quick means of supplying food when availability and accessibility are severed. This picture suggests that this village has accessibility difficulties during the rainy season. …who in turn also resell the grains as they bought them, with high impurities as these photos reveal. Producers need much support in post-production activities in order to be competitive in international markets. as these images show, which are of a cowhide being used to draw water from a well. Student Media Grant winner Ryan Vroegindewey has extensive experience working in West Africa, first as a Peace Corps volunteer but most recently as freelance photographer. Ryan holds a Master’s from Michigan State University in Agricultural, Food and Resource Economics; he also earned a BA in History from Covenant College. Click here to check out more of Ryan’s photography!